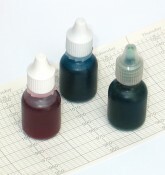 We can supply a wide selection of steel and fibre nibs suitable for many different makes of barograph, and red, green and blue ink. Fibre nibs are disposable and can be expected to last for up to two years of normal use. They cannot be re-inked.